Nebraska Farmers who have drought damaged corn which could be swathed and baled, chopped, or grazed can list that on the Nebraska Hay and Forage Hotline. The hotline is available free of charge for buyers and sellers to list feed resources. Call the hotline at 1-800-422-6692 to list the forage you have or to list your need for forage. I’ve been contacted by Extension Educators in the Sandhills asking if we have any producers willing to rent cornstalks for grazing this year to please let me know and we will put you in touch with producers in the Sandhills who need forage. UNL Extension has developed a Drought Resource Web resource that pertains to crop and livestock producers. Some of you have been asking about options for dryland crops right now. Research has shown benefits to the following crop if stubble height is left at least 10 inches tall when haying or cutting silage from drought damaged corn fields. Leaving a higher stubble height will also reduce the nitrate levels in the forage that has been cut. If grain prices remain high, grain yield may not need to be very high to justify selecting grain harvest over forage harvest. Sometimes leaving the corn residue can result in increased yield next year and that increase may provide more value than that resulting from forage use. See NebGuide G1846, Harvesting Crop Residues for information on evaluating your situation. Check labels of all chemicals applied to be sure they are cleared for forage use and that the minimum harvest interval has been met. Check with the USDA Farm Service Agency and your crop insurer to maintain compliance with farm programs and crop insurance requirements. 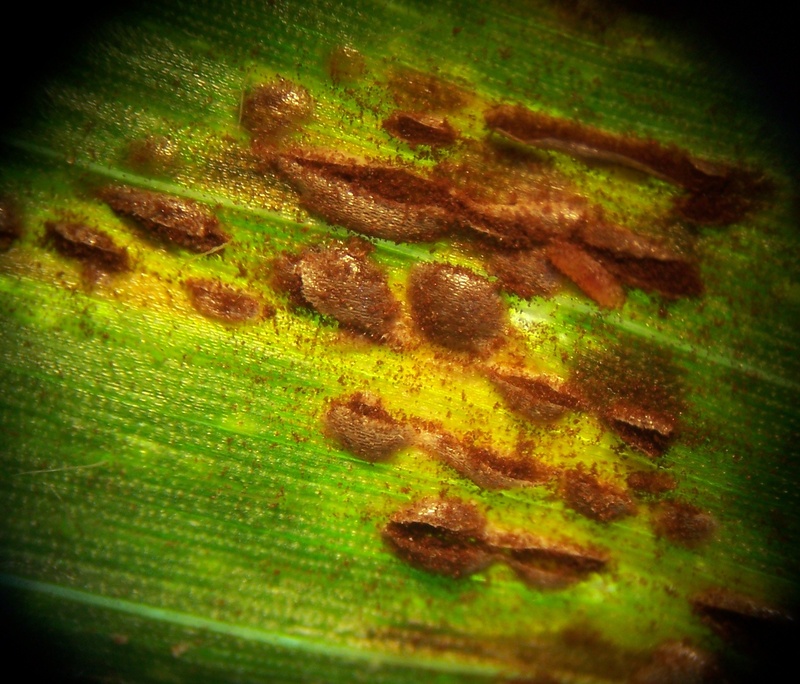 Nitrate concentrations can reach toxic levels in weather-damaged corn. The harvest method can affect the nitrate, a particular concern when its being fed to livestock. Leaving a tall stubble (8 or more inches) will reduce nitrate risk but note eliminate it. Choose the harvest method accordingly. Silage may be the safest method of harvest as fermentation usually (but not always) reduces nitrate levels and risk. Yield is about one ton per acre of silage for each harvested foot of earless corn plant (not counting the tassel). Feeding value is about 70% to 80% of well-eared corn silage. Corn with some grain (less than 50 bushels) tends to produce about one ton of silage for every five bushels of grain with a feed value about 80 to 90% of regular corn silage. If corn has pollinated, delay silage harvest until all chances of increased biomass tonnage have passed or plants naturally dry down to appropriate moisture levels. Corn can be windrowed and allowed to partially dry before chopping. Excessively wet material can be blended with drier feeds such as ground hay, cracked grain, or dried distillers grains. However, this can take a lot of material — about 500 lb of grain or hay to reduce each ton of chopped corn with 85% moisture down to 70% moisture. Silage inoculants may improve fermentation and preservation of drought-damaged silage. 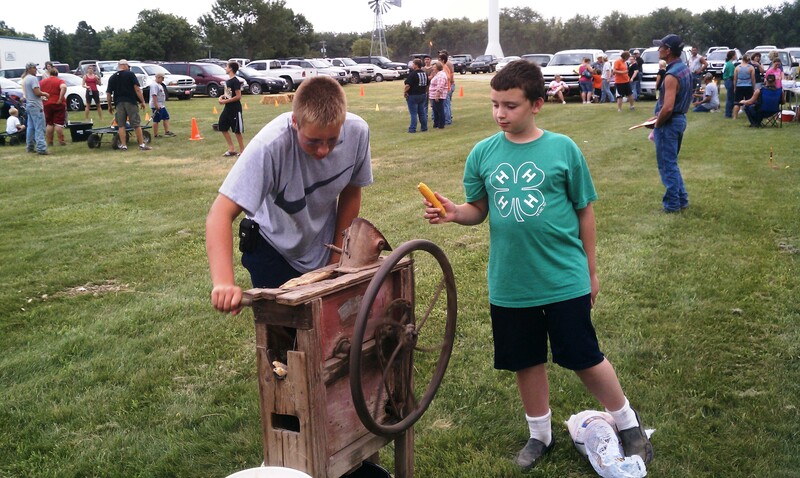 Green Chop: Green chop minimizes waste but may be the most dangerous way to salvage corn. If present, nitrates will start to change into nitrites (about 10 times as deadly) as green chop begins to heat. Chop and immediately feed only an amount that animals will clean up in one feeding. Chop and feed two or three times per day instead of providing excess feed from a single chopping. If any green chop remains two hours after feeding, clean out bunks. Never feed green chop held overnight because nitrites can be exceptionally high. Be sure to allow plenty of bunk space (36 inches per cow is recommended) so boss cows don’t overeat and timid cows can get their share. Hay: Hay may be the most difficult method of mechanical harvest, especially if ears have started to form – the stalk and especially the ears will be slow and difficult to dry. If possible, use a crimper when windrowing. Unlike with silage, nitrate levels do not decrease in hay after it is baled. Some of the nitrate risk can be reduced by cutting to leave a tall stubble, about 8 inches. Tall stubble also will elevate the windrow off the ground, allowing air to circulate better through the forage and aid in drying. Grazing: Challenges with grazing include acidosis risk for cattle not accustomed to grain if ears have started to fill (smart cows will selectively graze ears), waste from excessive trampling, availability of drinking water, perimeter fencing, and nitrates. Reduce acidosis risk by feeding increasing amounts of grain similar to feedlot step-up rations before turning into standing corn that has much ear development. Reduce waste by strip-grazing with at least two or three moves per week; daily is best. Back fences are not needed because regrowth is not expected. Water can be hauled in as with winter corn stalks or lanes might be constructed with electric fence to guide animals back to water sites that are nearby. If strip grazing, animals can walk back over previously grazed areas since back fences aren’t needed. Perimeter fences can be built using the same fencing as for winter stalks. 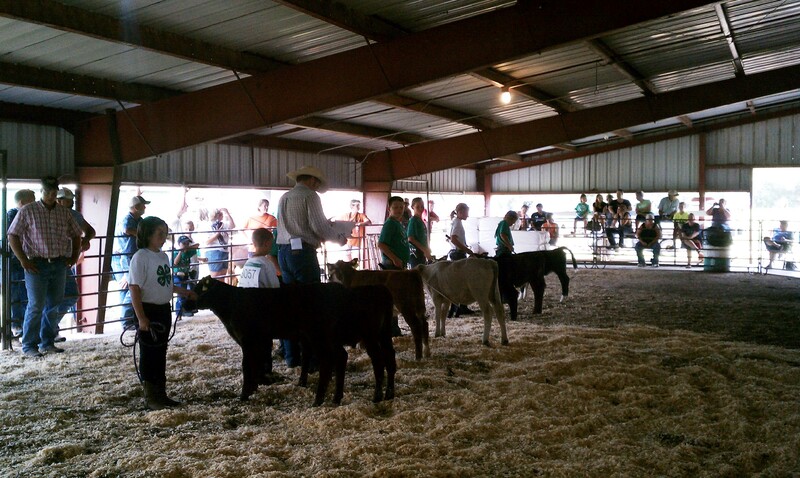 Cows are likely to respect such fencing but inexperienced calves may not remain where desired. To better control calves, use a double strand of electric wire and/or a more visible barrier such as electric polyrope or polytape. Animals not already experienced with electric fences may need some exposure and training before moving them to a corn field. Nitrates usually are not a problem with grazing since the highest concentration is in the stem base, the plant part least likely to be consumed. Risk increases, though, if animals are forced to “clean-up” a strip before moving to fresh feed and when corn plants are short (probably less than 3 to 4 feet tall) with small, palatable stem bases. Tests for nitrate concentration (whole plant and just the bottom 8 inches of the stem base) can be made prior to grazing to assess risk. If nitrate levels are risky, the hazard can be reduced by offering enough desirable forage to discourage consumption of hazardous plant parts as a major component of diet. Also, delaying grazing until plants more fully mature often lowers nitrate risk. NebGuide G1865, The Use and Pricing of Drought-Stressed Corn, offers additional information. Windrow Grazing: This method includes cutting as you would for hay and then grazing the windrows rather than baling them. It eliminates the cost of baling, transporting bales, feeding bales, and maybe hauling manure. It also eliminates any flexibility in feeding location and may reduce opportunities to sell the corn forage. Windrowing tends to preserve forage quality better than allowing plants to stand. Usually it is easier to strip graze windrows than standing corn because building fences and estimating strip size are easier. Snow cover rarely causes problems if animals already know the windrows are there. They will use their hooves and face to push snow aside to access the windrow. Thick ice, however, can cause a significant barrier. Follow appropriate management recommendations listed earlier for hay and grazing for best utilization and safety. The past few weeks I’ve received questions on how the weather conditions are impacting corn yields. One way to help predict this is by running the Hybrid Maize model developed by researchers in the Agronomy and Horticulture Department at UNL. 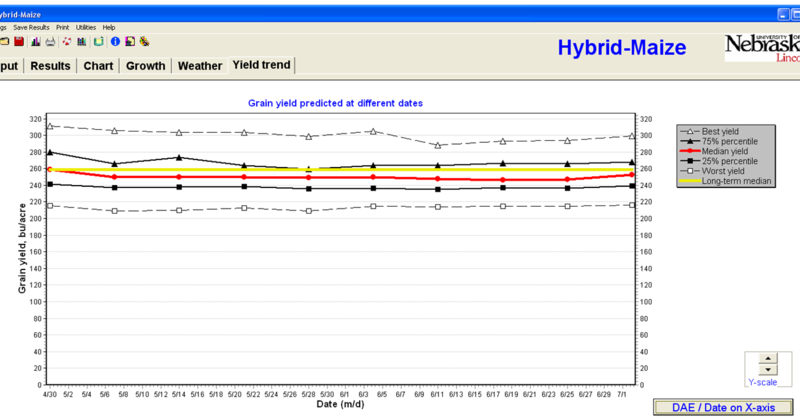 I ran Hybrid Maize model simulations for various planting dates in the Clay Center, NE area. This model predicts corn yields using weather data under “perfect conditions”-nothing such as nutrients or water is limited and there is no disease or insect pressure in these simulations. Reality is that all these things do occur. To use the model, I input current season weather data from the High Plains Regional Climate Center which allows me to compare the current growing season weather conditions and potential yield impacts to a long term median 30 years worth of weather and yield data. For the simulations I ran right now using Clay Center weather data, I found that overall, we are trending below the 30 year median average yields for both irrigated and rainfed corn. Right now the long-term median yield for all irrigation simulations is trending towards 259 bu/ac at planting populations of 32,000 seeds/acre with 113 or 115 day relative maturities. The following are a few simulations and please check out this week’s CropWatch to view simulations across the Corn Belt. Click on the images below to view them closer up. Compare the 2012 median yield line (in red) to the long-term median line (yellow). Mar. 27 planting date, 115 day rm: Best yield 300 bu/ac. Predicted mean is 241 bu/ac. Apr. 15 planting date, 113 day rm: Best yield 293 bu/ac. Predicted mean is 242 bu/ac. Apr. 15 planting date, 115 day rm: Best yield 200 bu/ac. Predicted mean is 253 bu/ac. May 1 planting date, 113 day rm: Best yield is 286 bu/ac. Predicted mean is 248 bu/ac. May 1 planting date, 115 day rm: Best yield is 293 bu/ac. Predicted mean is 252 bu/ac. May 15 planting date, 113 day rm: Best yield is 310 bu/ac. Predicted mean is 253 bu/ac. The best comparison is the predicted mean to the long-term median so right now we’re seeing a slight drop below the long-term median for all the planting dates and relative maturities run in these simulations. However, if we receive cooler night-time temperatures and a longer fill period like last year, we may see these yield trends turn up. Mar. 27 planting date, 115 day rm: Best yield is 202 bu/ac. Predicted mean is 140 bu/ac vs. long term median of 163 bu/ac. April 15 planting date, 113 day rm: Best yield is 224 bu/ac. Predicted mean is 146 bu/ac vs. long term median of 167 bu/ac. May 1 planting date, 113 day rm: Best yield is 223 bu/ac. Predicted mean is 152 bu vs. long term median of 167 bu/ac. May 15 planting date, 113 day rm: Best yield is 250 bu/ac. Predicted mean is 161 vs. long term median of 165 bu/ac. With the high heat, lack of rainfall, and pollination occurring in many fields or just around the corner, questions have been rolling in regarding how high heat affects corn pollination. Dr. Tom Hoegemeyer, UNL Agronomy Professor of Practice wrote the following article and I’m sharing it for the excellent info. Hybrid Maize simulations will be shared in this week’s CropWatch and in next week’s news article. “Corn was originally a tropical grass from the high elevation areas of central Mexico about 7,400 feet above sea level, 2,000 feet higher than Denver. Today, corn still prefers conditions typical of that area — warm daytime temperatures and cool nights. 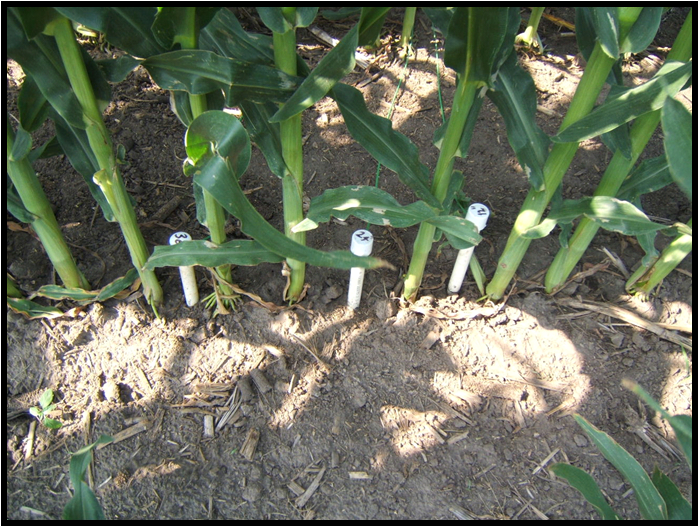 Areas that consistently produce high corn yields share some significant characteristics. These areas — central Chile, the west slope of Colorado, etc. — are usually very bright, clear, high light intensity areas with cool nights. This year, in the prairie states and in the Cornbelt, conditions have been dramatically less than optimal. Corn maximizes its growth rate at 86°F. Days with temperatures hotter than that cause stress. In the high yield areas, cool night temperatures — at or below 50°F — reduce respiration rates and preserve plant sugars, which can be used for growth or reproduction, or stored for yield. These are optimum conditions for corn, and interestingly, are fairly typical for areas around central Mexico where corn is native. In years when we get high day and nighttime temperatures coinciding with the peak pollination period, we can expect problems. Continual heat exposure before and during pollination worsens the response. Daytime temperatures have consistently stayed in the upper 90s to low 100s.The high humidity, which helps reduce crop water demand, also increases the thermal mass of the air—and provides extra stored heat and insulation at night. 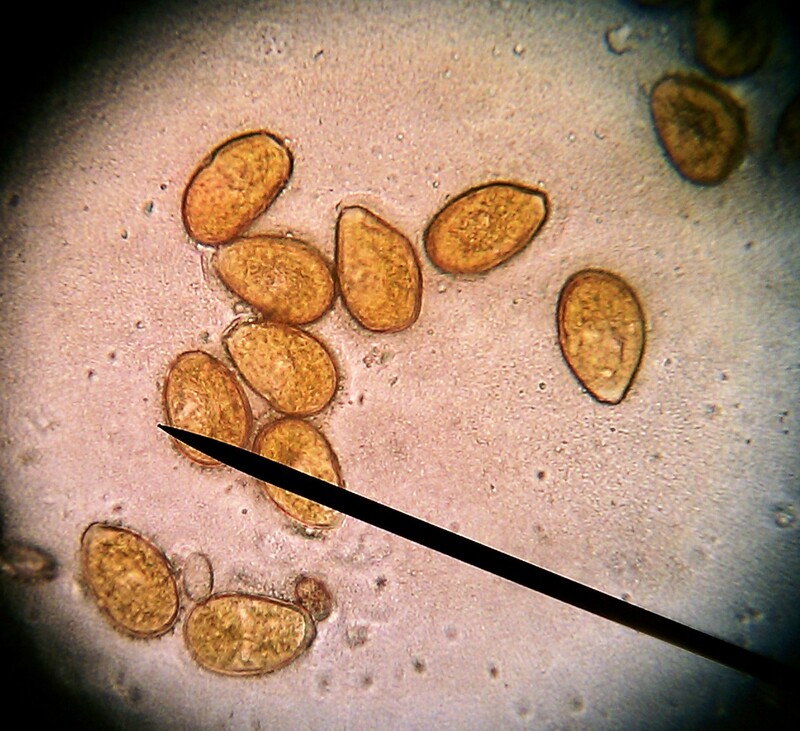 Corn pollen is produced within anther sacs in the anther. The plant releases new, fresh anthers each morning, starting from near the top of the tassel, on the first day of shed, and proceeding downward over several days. The process of releasing the pollen from the anthers is called “dehiscence.” Dehiscence is triggered by the drop in humidity, as the temperature rises. However, when it is extremely humid and the humidity falls very little, dehiscence may not occur at all, or it may be delayed until late in the day. If one has breezes, while the humidity is still very high, the anthers may fall to the ground before pollen is released. If the temperature rises too high before pollen dehiscence occurs, the pollen may have reduced viability when it is shed. 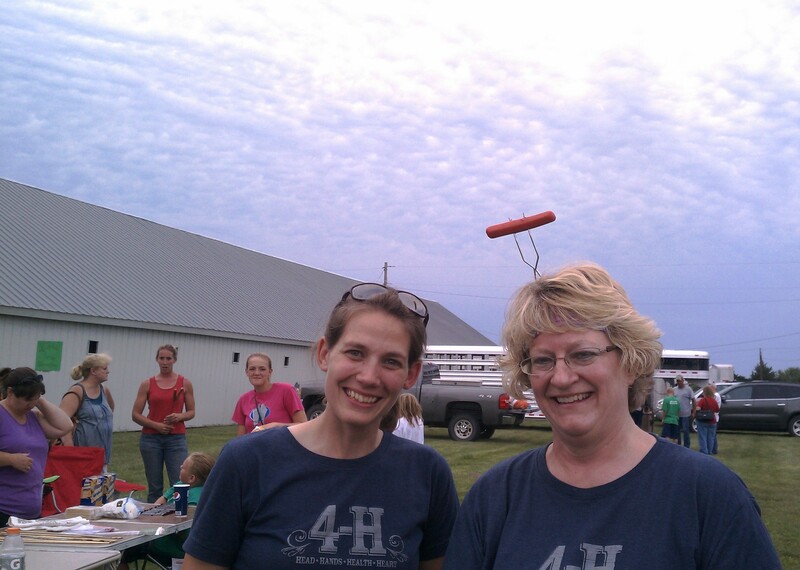 A person experienced at hand pollination in corn will often see this happen. There will be anthers in a “tassel bag,” but little pollen. The usual solution to this is to wait a couple hours until the temperature rise reduces the humidity. 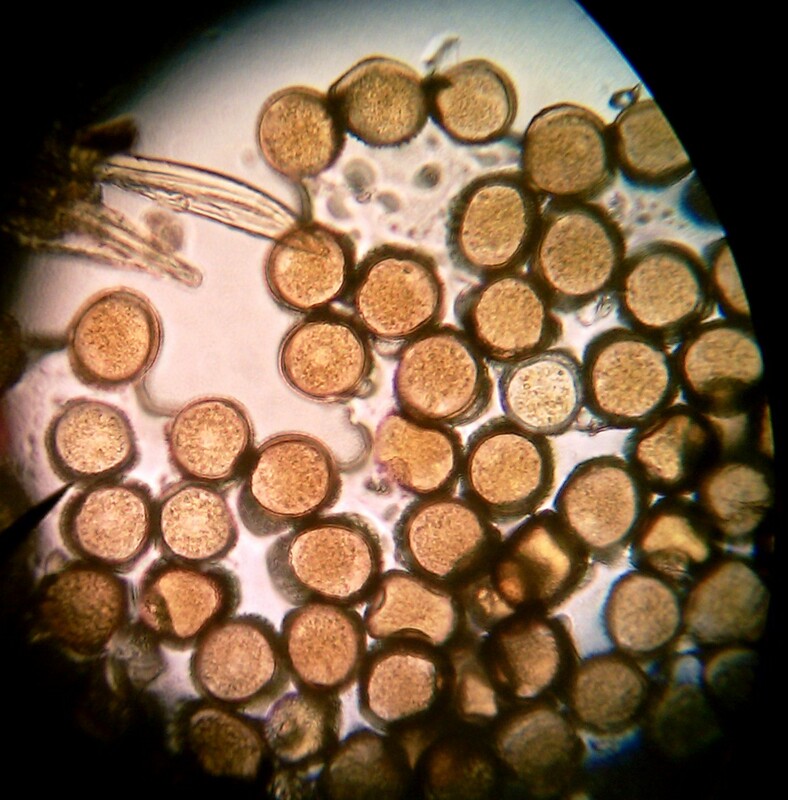 However, last year we had some conditions where pollen was never released from the anthers. This can impact silk fertilization, particularly in open-pollinated situations. 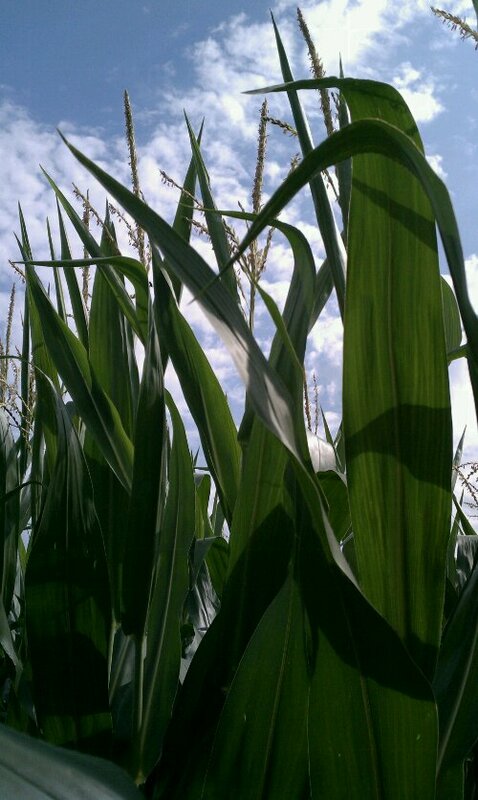 Corn is a “C4 Photosynthesis” plant, making it extremely efficient at capturing light and fixing CO2 into sugars. One drawback of this system is that with high daytime temperatures, the efficiency of photosynthesis decreases, so the plant makes less sugar to use or store. High nighttime temperatures increase the respiration rate of the plant, causing it to use up or waste sugars for growth and development. This results in the plant making less sugar but using up more than it would during cooler temperatures. Heat, especially combined with lack of water, has devastating effects on silking. If plants are slow to silk, the bulk of the pollen may already be shed and gone. Modern hybrids have vastly improved “ASI” or anthesis-silk interval (the time between mid-pollen shed and mid silk). Regardless, in some dryland fields we see seed set problems because of “nick” problems between pollen and silking. Even with adequate moisture and timely silking, heat alone can desiccate silks so that they become non-receptive to pollen. This is a bigger problem when humidity is low and on hybrids that silk quite early relative to pollen shed. Even with dew points in the 70s, when temperatures reach the high 90s to the100s, the heat can still desiccate silks and reduce silk fertility.